Not only do major Internet search tools offer filters and settings to protect your family, but a variety of supplementary tools are available that you can use to monitor and screen the search results that appear to your children. Search engines have been created with kids in mind to provide them with a safe way to search for the information they need and the answers to the questions they have. On the Search Settings page, select the Filter Explicit Results check box. To lock the SafeSearch setting, click the Lock SafeSearch link to the right of the SafeSearch Filters check box. You might be asked to sign in to your Google account to complete these steps. On the SafeSearch Filtering page that appears, confirm by clicking the Lock SafeSearch button. You will receive a confirmation page, and Google will appear differently on your computer, making it possible to tell from across the room whether your children are searching the web via a SafeSearch-enabled Google page. To verify that your child is using SafeSearch, look for the colorful spheres in the top-right corner of all search pages. 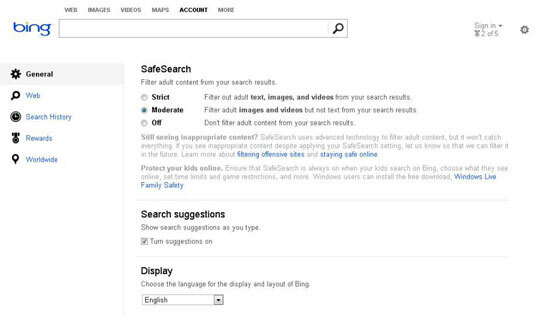 Strict: This selection filters out adult text, images, and videos from the search results page. Moderate: This selection filters out adult images and videos but not text from your search results page. Off: This setting completely turns off filters from search. Click the Save button in the lower-right corner of this screen to save your settings.